Wash okra under running water and slice off the ends. Cut each in half. Set aside. In a wok or heavy skillet, heat the oil and sauté onions till they become translucent. Add all the spices, except garam masala, and stir-fry for 2 minutes. Add tomatoes and fry for 1 minute. Add okra and stir-fry for 2 minutes. Cover and steam over medium heat, until tender (about 12-15 minutes). 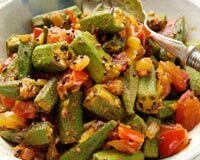 Spoon the okra onto a warm serving plate and sprinkle with garam masala.